How to wear long coat and how to style a coat with different outfits might seem very easy to you but you need to keep a lot of things in mind before wearing and matching an outfit. Knowing which style of coat looks best with what outfit is very important and it can help you change an entire look. Wearing long coats as work wear outfit is very popular trend in winters.Check out cute workwear outfits combinations.There are different length coats available and we will be discussing few of the styles. The cape coat style is quite popular style and very elegant. They are quite trendy. You can wear it with a inner and cigarette pants. Choose the perfect colors for the inner and the coat. 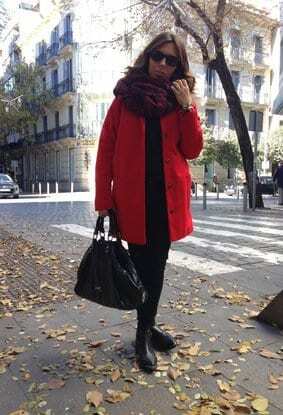 You can go for a sleeveless long coat and pair it up with gloves and long boots.Then another choice is a cropped coat. It is very important to look at the coat lengths. You can wear a long dress with layers and a cropped coat over you long dress. A maxi would be preferable and great for a party. A third option would be a knee-length coat. Wearing it in winter is a great option. You could wear it with a skirt. Make sure that the coat is longer than your coat. You can also wear a trouser with a knee length coat. I am sure you would look elegant and stylish.In recent times floor-length coats have been pretty famous and preferable. It is a great street style and you can wear it on different occasions too. A floor-length coat is said to be very dramatic and classy. Keep the rest of your outfit very simple so it does not look overboard. You can play with different colors. It is a winter season so you can choose dark and vibrant colors so that you can stay warm and cozy. Long Trench coat is a classic and favorite this season. Save a good amount of money and purchase a trench coat. It is truly one item that’s worth investing in. Go for very neutral colors and pair it up with peplum tops and short outfits. You can wear it with a waist belt. You need to have a little knowledge on how to style coats and you are good to go. You need to take a lot of things in account when it comes to how to wear a coat. Here are some images we have taken from chicisimo.com, you can take adequate amount of ideas from the pictures and change your style. Hope you had a good time reading today’s topic. Do try out different outfits with these coat styles so that you know what suits you. Style it with High Heels. Wear it with Leather Pants. See other outfit ideas how to wear leather pants different outfits. Style it with Knee High Boots. Wear it for a sports look with Ripped jeans and Sneakers.